67% of registered voters don’t think North Korea will get rid of its nuclear program, and 52% said partial denuclearization is also unlikely. 49% said they were confident in Trump’s ability to handle the threats posed by North Korea as he prepared for his historic meeting with Kim. Older voters are more optimistic than younger Americans about the summit’s effect on U.S-North Korea relations. 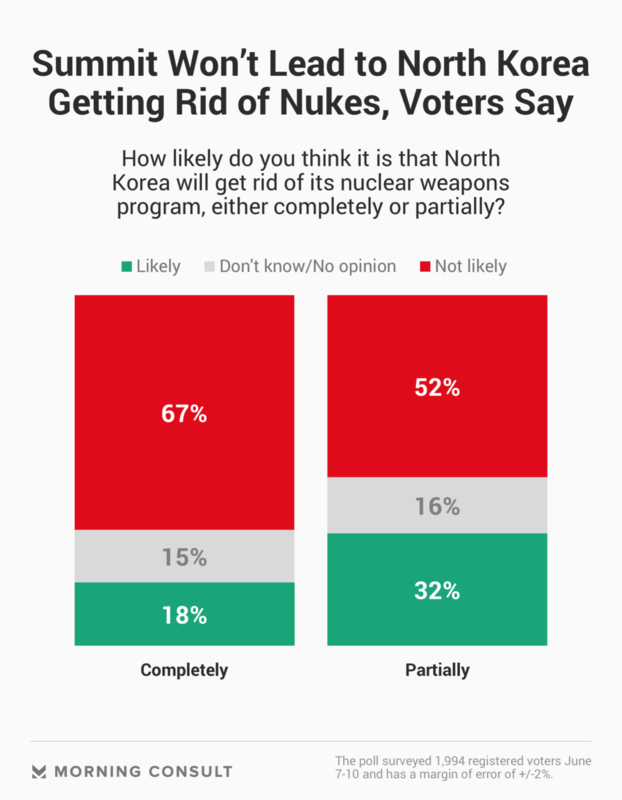 Most U.S. voters don’t think North Korea will get rid of its nuclear weapons program as a result of this week’s summit with Kim Jong Un and President Donald Trump in Singapore, according to a new Morning Consult/Politico poll. The June 7-10 survey was conducted online among 1,994 registered voters, ahead of the historic meeting. Sixty-seven percent of respondents said North Korea won’t get rid of its nuclear program completely, and 52 percent said even a partial dismantling is unlikely following the Trump-Kim meeting. 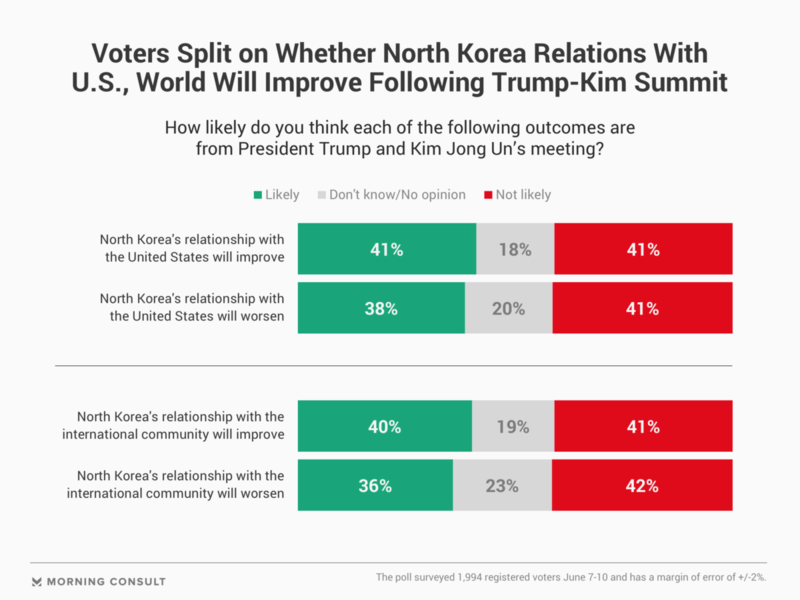 Voters were split at 41 percent when asked whether the summit was likely to result in improved relations between the United States and North Korea. Eighteen percent said they did not know or had no opinion. Forty-nine percent of voters age 65 or older said they think the summit will likely result in better relations between the two countries, a view shared by 44 percent of voters age 55-64. Among adults age 54 or younger, that sentiment was held by about 35 percent to 38 percent of respondents. Four in 10 registered voters said it was likely the summit will result in improved relations between North Korea and the international community, while 41 percent said it was unlikely. The poll has a margin of error of plus or minus 2 percentage points. Ahead of the Trump-Kim meeting, 49 percent of survey respondents said they were confident in Trump’s ability to handle the threats posed by North Korea, while 44 percent said they were not. When it comes to actions aimed at pressuring North Korea to denuclearize, U.S. voters continue to support a diplomatic approach over other possible options, such as increased sanctions. Eight in 10 voters back continued diplomatic efforts to encourage North Korea to suspend its nuclear weapons program, while 66 percent support sanctions against its government and leaders, and 62 percent support sanctions on countries that trade with North Korea. A 47 percent plurality of voters said they oppose airstrikes against military targets and suspected nuclear sites in North Korea, and 64 percent oppose using ground troops to take control of the country. This story has been updated to reflect the start of the summit.